JACKSONVILLE, Fla. (AP) — The Jacksonville Jaguars are preparing to play without running back Leonard Fournette again, maybe even for a longer stretch than before. 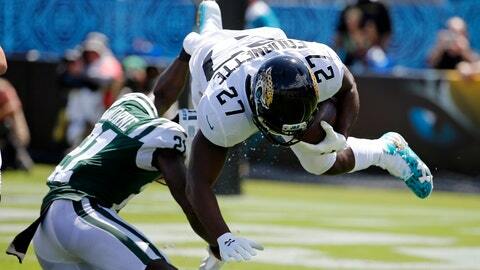 Fournette re-injured his right hamstring in a 31-12 victory against the New York Jets on Sunday, and coach Doug Marrone has no timetable for his return. Marrone said tests show the injury is no worse than it was before returning. Considering Fournette missed two and a half games after initially tweaking it and came back too soon, it makes sense that the Jaguars (3-1) would be even more cautious this time around. Jacksonville plays at Kansas City on Sunday and almost certainly will be without Fournette. The Jags should be getting used to it by now. The second-year pro has missed five of 20 regular-season games and left his only two starts this season because of hamstring tightness. He ran nine times for 41 yards in the season opener in the first half, and carried 11 times for 30 yards against the Jets in the first half. Marrone declined to speculate on how long Fournette would be sidelined. Even though Jacksonville is 4-1 without Fournette in the starting lineup, no one questions how important he is to the team. The run-first, old-school Jaguars built their entire scheme — offensive identity, really — around Fournette and his skillset. T.J. Yeldon is expected to continue getting the bulk of the work during Fournette’s absence, with Corey Grant serving as a change-of-pace option. Yeldon has 205 yards and a touchdown on 49 carries this season. He also has 14 receptions for 125 yards and two scores. Quarterback Blake Bortles might be the biggest beneficiary, forced to carry more of the offensive load. Bortles threw for a career-high 388 yards and two touchdowns against the Jets, giving him two games with at least 375 yards passing in the last three weeks. “Blake has a way of showing up when he needs to show up,” Gipson said. “If you take away the (Tennessee) Titans game, when I don’t think anyone played their best game, the offense just finds a way. And they’ve been doing it since the end of last season. They’re taking opportunities of what the defenses will give them. That’s paying big dividends for us. The best defense is the defense that’s sitting on the sidelines. We did a lot of that in the first half Sunday.